1997-2003 Participation, most years, in the Anglican-Roman Catholic Bishops’ Dialogue at the National level. 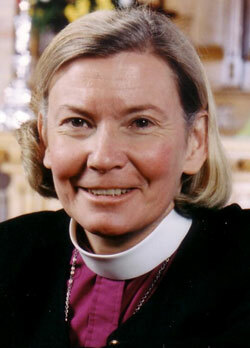 1998-present Episcopal Chairperson for Advisory Committee on Postulants for Ordination. University of Geneva summer school. St. George’s College, Windsor: Women and Authority (2 consultations). Various retreats: Cowley Fathers, Cambridge, MA; SSJD Edmonton and Toronto; community of Taizé, France. Two 2 – 3 month sojourns with the Sisters of St. Margaret in Port-au-Prince, Haiti, teaching in inner city school and assisting with Missions and fundraising. Recreational Interests: Reading, hiking, swimming, Anglican history and theology. 2001-2004 Trustee, Berkeley Divinity School, Connecticut, U.S.A.
1995-2004 Member of the Corporation and Successor Trustee Yale University, Connecticut, U.S.A.
2001 Led young persons pilgrimage to Santiago de Compostela and Taizé, France. 1987-1994 Chairperson of North Yorkers for Disabled Persons, Inc. Presented a paper to the Archbishop’s Working Group on Women in the Episcopate of the Church of England. The Primate of the Anglican Church of Canada is first and foremost a baptized Christian living the life of discipleship. The Primate is also in ordered ministry as a bishop, called to guard the faith, unity and discipline of our church. It is not an easy calling but it is exciting and challenging. I will look at the Primacy of the Anglican Church of Canada through three different lenses: the Anglican Communion; the Anglican Church of Canada; and the world Christ died to save. It was the bishops of Canada who first requested a meeting of the bishops of the Anglican Communion. The Lambeth Conference continues to meet every ten years. In between the Primate has a primary ministry as the meeting point of the Anglican Church of Canada and the Anglican Communion. As such, the Primate’s ministry is in part the ministry of Ambassador, visiting many other provinces of the Communion while never forgetting he/she is a Canadian Anglican. At this time relationships within the Communion are threatened. Recognizing that every province has something to teach and much to learn, I believe we need to strengthen our commitment to the Communion and our common faith. The Primate has a unique understanding of the particularities and catholicity of the dioceses and parishes of the Anglican Church of Canada. Once again there is a distressing tendency to think that we don’t need each other. The leadership of the Primate needs to call for unity via the ministries of discernment, encouragement and teaching. Having no jurisdiction, the Primate must lead by example and inspiration. While having a relationship with the whole Anglican Church of Canada, the Primate needs to nurture especially the relationship with the House of Bishops, Council of General Synod and Church House. Moral and prophetic leadership are especially important in times of crisis. Most essential are prayer and the study of the faith. In recent Anglican history, I recognize such personal holiness and prophetic leadership in numerous primates; Archbishops Desmond Tutu and Rowan Williams come particularly to mind. The Canadian Primate embodies the memory and story of our church. I have especially appreciated this gift in Archbishop Michael Peers. As we continue in our pilgrimage of healing and reconciliation with our indigenous brothers and sisters, the Primate will have a special ministry incorporating story and symbol in order to teach the faith and draw the faithful together in community. It is important that the Primate not be hijacked by any one issue or agenda. Our Primate needs to have a voice that addresses and is in dialogue with our government leaders. Canada is not a Christian country but that doesn’t mean there is no place for the prophetic call to peace and justice. It is the Church’s vocation in Christ to waken the conscience of Canada. The Primate is best situated to deliver and articulate statements of our Church to the elected leaders of our nation. In terms of the global village it is the role of our Primate to work alongside other church leaders to address ethical and moral questions and to make statements about political issues. Both inside and outside Canada the Anglican Church needs to give voice to the Gospel of Jesus Christ in concert with other Christians, and in response to the leading of the Spirit.